A good alternative from the full price Nespresso capsules. I've not tried them all but like the purple ones and going to give the others a go when these arrive. 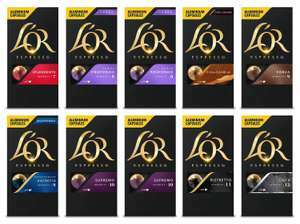 L'OR Espresso Variety Pack includes 10 individual packs, offering the full range of 8 different L'OR variants. This includes an extra pack of two of L'OR Espresso's most desirable variants - Supremo and Lungo Profondo. They're quite often less than this. They were £19 as recently as Saturday! Are you sure? They're £2.50 at York asda and online. 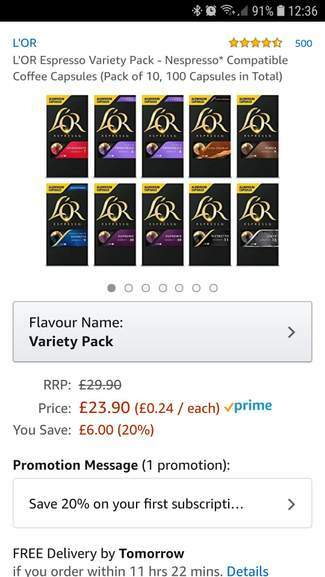 I bought L'or supreme for £17/100 capsules during xmas offers, but never seen L'or varieties on offer for this low before, L'or is often sold at £2 in tesco and other retailers but only couple or few flavours would be shelved. Decent deal, I recently paid £27.63 for these as a birthday present for my dad. Great coffee too and presumably recyclable anywhere that recycles genuine Nespresso capsules, as they're fully aluminium. I've picked up the Profondo packs for £17.99 in the past, but the variety packs are generally more expensive.